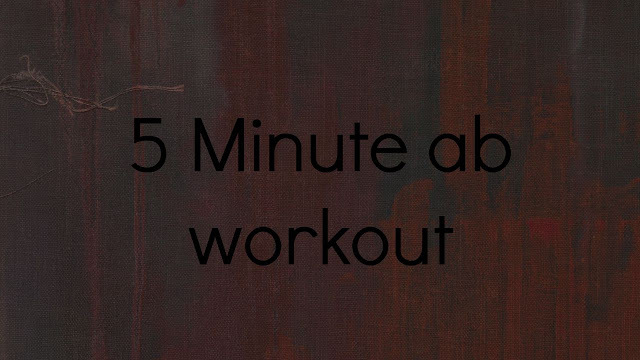 so today I'm posting my first workout post!! I'm actually really excited to write this! So let's just get into my 5 minute ab workouts. 15 regular crunches: Crunches are the classic exercise when thinking about working the abs. Crunches strengthen your core, which helps with balance, posture, as well as many other things. 15 cross body crunches: These types of crunches are pretty similar to regular crunches, but they work your side muscles as well as your abs. 15 crunches with your legs up: Again, similar to crunches, but I feel like alternating between these 3 types of crunches is more interesting than just doing one type! 15 leg lifts: leg lifts slim your lower stomach or "muffin top" area, which almost everyone can use! Repeat this process 2-3 times depending on how tired you get lol. I know this isn't the most complex workout but honestly I am just getting into the whole fitness thing. I have been researching and creating my own mini workouts and doing 3-4 of them a day. I hope this helped a couple of you out! and please please let me know our favorite workouts in the comments cause I REALLY wanna try them! if you guys liked this post it would make my day if you could comment and/or share!